Here’s the dish! 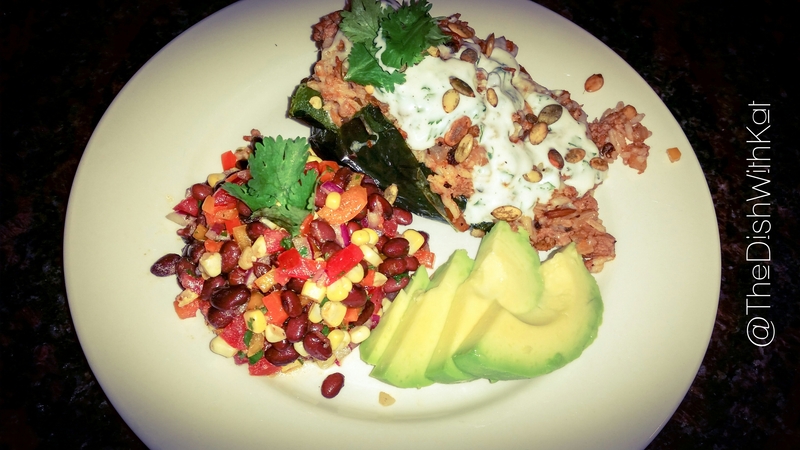 On Sunday, I cooked Blue Apron‘s Rice & Beef-Stuffed Poblano Peppers with Lime-Crema Sauce. It was packed full of flavor and delicious. My eyes are often larger than my stomach, so I thought I would need more than just the stuffed pepper for dinner. I later found out I was incorrect in this decision, but the black bean and corn salad I whipped up to accompany the stuffed peppers was a nice accent to the meal. As with many Blue Apron meals, I made a few modifications. 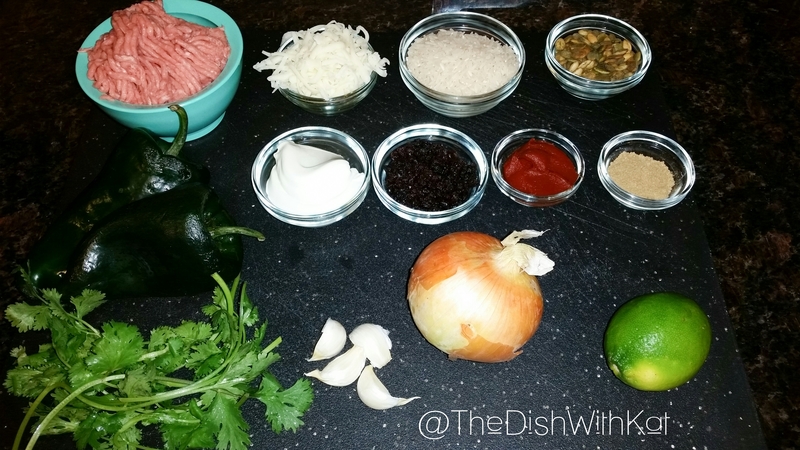 Here’s how you can put your own twist on this flavorful Blue Apron meal! Recipe ingredients (left to right, top to bottom): 8 oz. ground turkey, 2 oz. shredded cheese, 1/2 cup long grain white rice, 3 Tbsp. roasted pepitas, 2 poblano peppers, 1/4 Mexican crema, 3 Tbsp. currants, 2 Tbsp. tomato paste, 2 tsp. ground cumin, 1 bunch cilantro, 4 cloves garlic, 1 yellow onion, and 1 lime. In the past few days, I’ve eaten a lot of red meat, so I just wanted a healthier option for my protein here. I picked up a package of the regular ground turkey (includes dark meat) from Trader Joe’s for $2.99 per pound. When I use ground turkey, I prefer the dark meat version because it’s most similar to ground beef. You could use the ground breast meat if you’re looking to cut even more calories and fat, but I would definitely up the spices to enhance the flavor of all-white ground turkey meat. 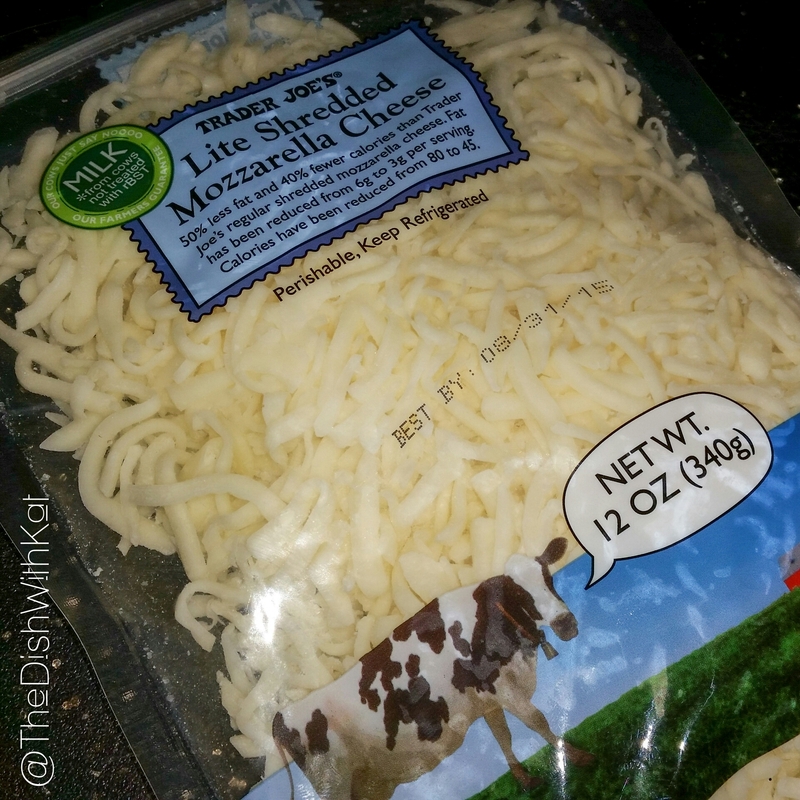 Trader Joe’s Lite Shredded Mozzarella Cheese has 45 calories and 3 grams of fat per one-ounce serving. Who doesn’t like cheese?! I often go for full fat options with cheese and just use it sparingly, but I’ve discovered that the low-fat mozzarella at Trader Joe’s is quite flavorful. I use it often when I make my flatbread naan pizzas (I’ll tell you all about these soon), and quite honestly, it tastes like regular, full-fat mozzarella. I stirred a handful of cheese into the meat mixture and sprinkled some on top of the peppers before adding them into the oven. The recipe called for garnishing with whole cilantro leaves, but this was a large bunch of cilantro. Unless you’re making an herb salad, you just don’t need that many whole leaves of cilantro for garnishing. I finely chopped about three-quarters of the leaves for the lime-crema sauce and left the rest whole for garnishing. The recipe also called for pepitas mixed into the meat mixture. I tasted them before adding them, and I’m glad I did. They were seasoned, so I saved a few for garnishing. I liked the texture they added to the dish as a garnishment over the texture they had when mixed into the meat. They begin to absorb the moisture, so they lose the crunch factor when mixed in. Next time, I’ll save all my pepitas for garnishing. Black bean and corn salad is one of my go-to sides when cooking Mexican dishes. It’s super simple, and it’s really a game of what you have in your fridge. If you have the opportunity to go shopping, the best thing you can do is pick up an ear of fresh corn—especially if it’s the summer when corn is in season. You’ll thank me later for this. Sweet, summer corn is delicious. If corn is out of season, go for the frozen variety, but whatever you do, DO NOT USE CANNED CORN! It’s just blasphemous to use canned corn in a dish this delicious. I like to “taste the rainbow” in my salads, so again, if you have the opportunity to shop, pick vegetables with vivid colors. In addition to the black beans and corn, I used orange and yellow bell peppers (the miniature variety), red onion, a beefsteak tomato, and lots of fresh cilantro. I dressed it with lime juice, EVOO, salt and pepper, and a nice pinch of cumin to mirror the flavor from the stuffed peppers. It was delicious, and the next day, after marinating in the fridge overnight, it tastes even better. The leftover salad also pairs well with tortilla chips for a chunky black bean and corn salsa. You’re welcome. I’ve never stuffed a poblano pepper before. I’ve only ever stuffed a bell pepper, and I didn’t precook them; I stuffed them raw and cooked the filling and pepper all at once. When you’re stuffing a precooked pepper, you have to cut it open gingerly. This is something I learned after butchering through my peppers like Freddy Kruger. I pretty much ended up with a slice on the top and bottom of the pepper, which made it impossible to stuff. I had a great idea to use some mini loaf pans to contain the peppers, but I didn’t quite think far enough ahead about an extraction plan from the loaf pans. After attempting to use a spatula, I gave up and inverted them on a small plate and, for lack of a better description, tossed them onto my dinner plate. It was as messy as it sounds—there was filling everywhere, and the cheese stuck to the plate I inverted them on. I pieced them back together, and while it wasn’t my best plating job, I worked with what I had. I hope these modifications come in handy as you continue to explore with Blue Apron and other recipes. Happy cooking!